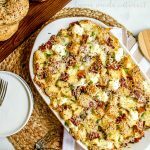 This simple make ahead breakfast casserole brings together everything you love about breakfast, everything bagels, bacon, cheese, and eggs. Grease a 13x9 inch casserole dish. Add ½ of the everything bagel cubes to the casserole dish. Sprinkle with half of the bacon. Then half of the Gruyere, and ½ of the cream cheese. Repeat with another layer of everything bagel, bacon, Gruyere, and cream cheese. In a bowl combine eggs, heavy cream, salt, and pepper. Whisk until thoroughly combined. Pour the egg mixture over the bagels making sure to cover all of them. Tightly over the casserole dish and place in refrigerator for 4 hours or overnight. When ready to bake cover the casserole with aluminum foil and place in the oven to bake for 40 minutes. Then remove foil and continue to bake for 15 minutes. Let cool for 10 minutes before serving. Garnish with chives and enjoy!